A leaking roof is often the first sign that your conservatory roof needs to be repaired. As such, it is advisable to inspect your conservatory roof regularly and watch out for signs of any leakage no matter how insignificant it may seem. A slight leakage can be patched to prevent further damages. However, replacing your conservatory roof system would be the ultimate solution. Conservatory roof leakages can damage your furniture, interior décor and furnishings that may be expensive to replace. Tough condensation is considered normal in a conservatory, it can signify a larger problem if it becomes overbearing and uncontrollable. In most cases, uncontrollable condensation is attributed to the sealant between the conservatory roof glass or uPVC. Using a humidifier and keeping the windows open are considered quick condensation fixes but are not always enough to address potential problems like having a damp conservatory room and stubborn mould growth. Unbalanced temperature is signified by your conservatory being extremely hot during summer and extremely cold during winter. Such unbalanced temperature impact the room’s functionality because it becomes unbearable during the two seasons. 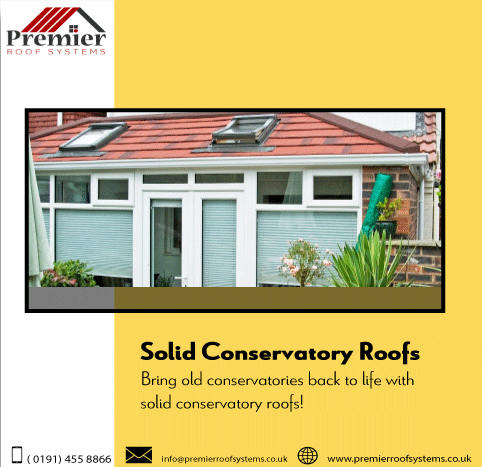 In such a case, it is advisable to replace your conservatory roof system with a solid conservatory roof option that offers better insulation and ensures that you are able to enjoy the room’s comfort all year round. Draft excluders and heaters are temporary options. If you spot damages like cracks on your conservatory roof, then it is time to engage a professional conservatory roof expert to access the damage and make the necessary repairs. If the noticeable damages are deemed serious, our professional conservatory roof system expert may recommend replacing the entire roof system as opposed to making repairs that may not always be sustainable. In most cases, homeowners are advised to opt for solid conservatory roof replacements because they lengthen the roof’s lifespan. Meaning that, you may not have to worry about conservatory roof damages for a number of years. A solid conservatory roof system is dubbed the best at ensuring that homeowners maximise their space despite the time of the year. They offer utmost protection against vandalism, weather elements and are long-lasting. Moreover, they are designed to be lightweight and sit on the conservatory framework without causing damages to the fundamental structures.